Police have been coming under ‘sustained attack’, the PSNI said. A TEENAGE GIRL was injured after a car struck a number of pedestrians in the Ardoyne area of Belfast today. Police have been coming under “sustained attack” during violent activity tonight, a PSNI spokesperson told TheJournal.ie. A car struck a number of pedestrians in Ardoyne at around 8.15pm tonight, the PSNI spokesperson said. There were no reports of anyone else being injured during this specific incident. The young woman run over at Ardoyne tonight has been medically assessed - her injuries are NOT life threatening. She’s in our thoughts. The driver of the car was arrested. There is heavy police presence in the Twaddell and Woodvale areas tonight while the annual Twelfth of July season takes place. Orange Order parades are banned from marching at a certain section of the Crumlin Road. Earlier this evening in Belfast city centre, a female police officer was attacked by two people. She was punched in the face by a man and then punched in the face by a woman when on the ground, the PSNI said. A male colleague who came to her aid suffered a wound to his hand. Another six police officers have been injured across the North this evening. There have been a number of police officers injured today, two whilst responding to an incident involving a vehicle and pedestrian. 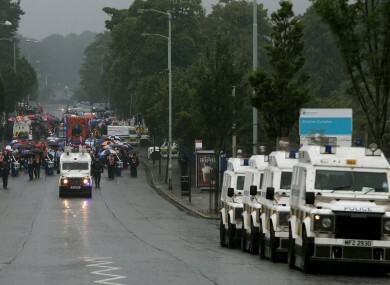 At this stage, there have been 8 officers injured responding to serious disorder at Twaddell. We are appealing for calm. We are appealing for community and civic leaders to assist in restoring calm to the area. Email “Teen girl injured after car ploughs into pedestrians in Ardoyne ”. Feedback on “Teen girl injured after car ploughs into pedestrians in Ardoyne ”.